Although many people feel that Japan is already doing quite a bit to improve the environment, with solar cells, hybrid cars, and power-saving air conditioners, these ‘contributions’ are not stopping people buying and burning more energy and producing greenhouse gasses in record quantities. Despite the massive global PR and economic benefits that Japan would reap if it took leadership on this issue, I’m surprised how little direction is being shown by government. 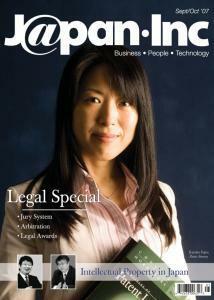 Last issue J@pan Inc ran an article on intellectual property in Japan by our writer Willhemina Wahlin. This was a small taster for this editon, our legal special and I’m pleased to see a continuation of our coverage of patent and trademark issues in Japan, including interviews with expert IP lawyers and a judge. We’ve also included articles on the jury system, arbitration and more, plus on the center pages you’ll find our indispensable Legal Services Directory. I found your article about CBRE and real estate in Tokyo to be highly interesting. Tokyo is obviously a prime market for such real estate services, and I would be very interested to know more about how CBRE can find closed market deals, and what their strategies are for dealing with landlords used to a more docile Japanese tenant base. Kazuko Fujita and lessons for trademark registration in Japan. Kazuko Fujita is founder and director of the LIL (Legal Interface Liaison) International Patent & Trademark Firm, responsible for an office of 30 staff, a fully qualified benrishi (Japanese patent attorney), a wife and a mother of two children. J@pan Inc's comprehensive directory of legal and law related services in Japan that have capabilities to deal with foreign clients. In the US, with its fast-paced legal environment, law firms are seeing the rise of a new trend: using realtime court reporters during attorney-client meetings to cut associates’ administrative workload. The karaoke machine was the brainchild of a man named Daisuke Inoue who, as legend has it, cobbled the thing together out of a car radio, a coin box and a small amplifier back in 1971. Tragically, Inoue did not patent his invention and has never made one yen directly from commercial sales of his invention; some have approximated his loss at around US$150 million. J@pan Inc attended this impressive ceremony at the Ritz-Carlton in Tokyo at the start of the summer. Asian Legal Business (ALB) is a well respected legal business magazine based out of Hong Kong and this was the third time that they have held an award ceremony in Japan.